Are Trans Mountain Expansion pipeline economic benefits enough to sway BC voters? Prime Minister Justin Trudeau, flanked by federal cabinet ministers, announces approval of Trans Mountain Expansion pipeline. An interesting feature of pipeline debates these days is the duelling “economic benefits” studies. The proponent commissions a study, opponents commission a study that invariably shows benefits are far less, there is a flurry in the media that confuses the public, then everyone forgets said studies. In the case of Trans Mountain Expansion, should we even care about economic benefits? 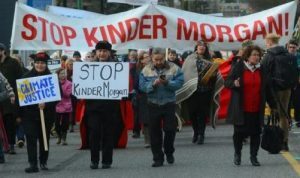 Kinder Morgan Canada released a Conference Board of Canada study in 2014 outlining the direct and indirect benefits of the pipeline (followed by an update in 2015). Not long after, Simon Fraser University released its own study, authored by the Goodman Group of Berkeley, California. The SFU study claimed the Conference Board was over-estimated the economic impact of the pipeline by a fact of three. I interviewed McArthur and asked him how in the world a respected organization could make such an egregious mistake? A close reading of the Goodman methodology revealed the California consultants had used an unorthodox (I’m being generous) approach. I interviewed Conference Board economist Michael Burt, who explained Goodman’s error. Then I checked with a few other economists, who backed up Burt’s take. The explanation is a bit tedious, so I won’t repeat it here, but you can read it in the previous column. The truth is that Goodman and crew either deliberately torqued their methodology or completely screwed it up. Then McArthur compounded the screw up by facilely accepting the study without review. Surely SFU has at least one competent economist who would have spotted the methodological mistake/deception? Goodman Group did not respond to interview requests made at the time I wrote the first column. 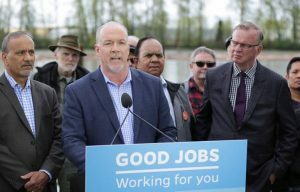 BC NDP leader John Horgan, speaking during campaign stop, says his party opposes Trans Mountain Expansion. 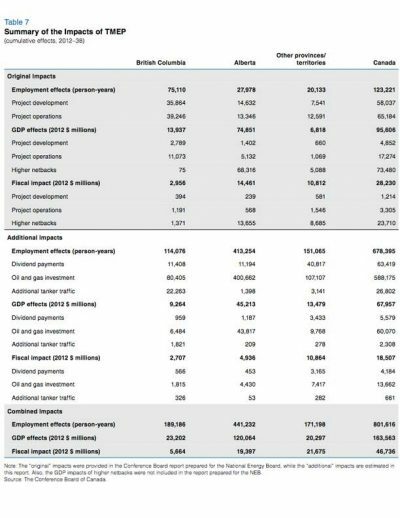 So, let’s examine the economic benefits calculated by the Conference Board of Canada study. The benefits for BC are not huge, but they’re not nothing, either. A total of 66,132 person years of employment, including both construction and operation phases. But the 30,269 PY during 20 years of operation equals 1,513.5 annually, which includes direct, indirect, and induced – basically, the multiplied effects of every dollar spent as it ripples through the British Columbia economy. Most of those jobs will presumably be in the interior, where sawmill closures have hurt forestry communities. The BC economy benefits to the tune of $13.3 billion over 20 years, or $665 million annually. And the provincial government enjoys an additional $2.118 billion or $105.5 million per year. The Conference Board economists later updated their numbers to include additional benefits from higher tanker traffic (additional 348 Aframax-size tankers docking in Burnaby each year), higher investment (greater profits that oil companies would mostly be re-invested locally), and higher dividends paid to investors (some of which would leak out of the Canadian economy because they would be paid to foreigners). 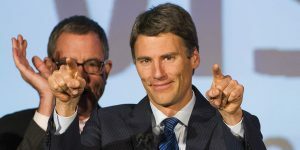 Vancouver Mayor Gregor Robertson and the City of Vancouver are vehemently opposed to Trans Mountain Expansion. The revised numbers are included in Table 7 above. Again, British Columbia does pretty well. But is “pretty well” enough to offset the minuscule environmental risks associated with the pipeline from Edmonton, Alberta to Burnaby, British Columbia, plus the threat of a spill from the increased number of tankers transiting coastal waters? As an energy journalist, I report on and write about that cost-benefit issue – or some variant of it – all the time. I don’t see an alternative to oil emerging for many decades. We’re stuck with oil for a long time. Therefore, as a British Columbia resident who lives 5 minutes from Semiahmoo Bay, I’m willing to accept the Trans Mountain Expansion risk. Many other British Columbians are not, especially those who live in the lower mainland, where opposition is highest. Their estimation of the risks is much higher than mine. They generally dismiss the benefits as insignificant. I’ve written dozens of columns about various aspects of the global Energy Transition (you can read samples here and here and here and here). A key feature of the Energy Transition is that all of the clean energy technologies that will eventually replace fossil fuels are in the very early stages of development and diffusion. They are at the very bottom of the diffusion S-curve. 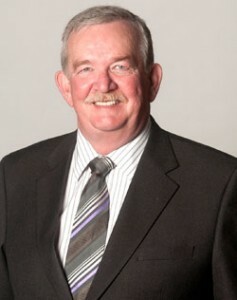 Burnaby Mayor Derek Corrigan is a vocal Trans Mountain Expansion pipeline opponent. What does that means for Trans Mountain Expansion? It means that oil and clean energy will compete for decades and decades, probably right up until the end of this century. The International Energy Agency is forecasting oil demand to rise from its current level of 95 million b/d to 113 million b/d by 2040, after which it will probably rise for awhile after that as the global auto fleet doubles to 2.4 billion vehicles. Oil is not going away. And if there is a demand for oil and Alberta can supply that oil to international customers at a profit and economic benefit to the owners of the resource, then Alberta should not be prevented from doing so. In fact, Alberta has a right to access Asian markets and the Canadian government has an obligation to make that happen, assuming that pipeline proponents like Kinder Morgan successfully complete the review process and meet all necessary conditions. But let me make this point very clear. Trans Mountain Burnaby Now photo by Cornelia Naylor. The coastal waters of British Columbia are not the province’s jurisdiction. Nor are pipeline right of ways that cross provincial borders, as Trans Mountain Expansion does. That jurisdiction belongs to the Canadian government by dint of the Canadian Constitution and legal precedent going back decades and decades. Prime Minister Justin Trudeau approved the Kinder Morgan project last Nov. 29. Case closed. End of argument. British Columbians should think of Trans Mountain Expansion as helping their neighbour to the east. NextCan Alberta govt kick-start petroleum value-added processing? Quebec has right to review Energy East, but is this BC all over again?